After the Maine sank in Havana Harbor, and the United States began drifting steadily closer to war with Spain. On Monday, April 25th, President McKinley reluctantly ratified a joint resolution of Congress which proclaimed that a state of war had existed between the United States and Spain since the previous Thursday. ... On May 11, Winslow, the revenue cutter Hudson and the Wilmington entered Cardenas Bay searching for mines. The commanding officer of Wilmington decided to take his ship escorted by Winslow and Hudson into Cardenas harbor in search of three Spanish gunboats reportedly in port. Winslow marked shoal water to Wilmington's portside and, upon reaching a point about 3,000 yards from the city, sighted a small, gray steamer moored alongside the wharf. The torpedo boat received orders to move in closer to determine whether or not the vessel was an enemy warship. ... Winslow reached a point approximately 1,500 yards from her quarry when a white puff of smoke from the Spaniard's bow gun signaled the beginning of an artillery duel which lasted one hour and 20 minutes. Winslow immediately responded with her 1 pounders, but enemy batteries ashore then entered the fray. The Spanish concentrated their efforts on little Winslow, and she soon received a number of direct hits. The first shot to score on the torpedo boat destroyed both her steam and manual steering gear. While her crew tried to rig some type of auxiliary steering system, Winslow used her propellers to keep her bow gun in position to fire. Then, all at once, she swung broadside to the enemy. Almost immediately, a shot pierced her hull near the engine room and knocked the port main engine out of commission. She maneuvered with her remaining engine to evade enemy fire and maintained a steady return fire with her 1-pounders At this point, Wilmington and Hudson brought their guns to bear on the Spanish ship and shore batteries and the combined fire of the three American warships put the Spanish gunboat out of action and caused the shore batteries to slacken fire. ... All but disabled, Winslow requested Hudson to tow her out of action. 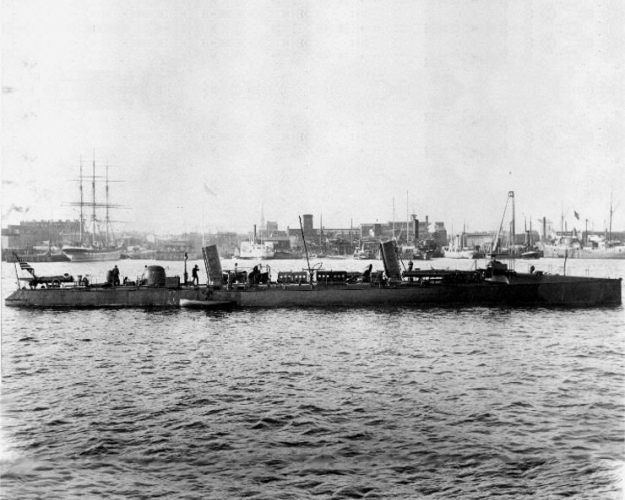 The revenue cutter approached the stricken torpedo boat and rigged a tow line between the two ships. As Hudson began to tow Winslow out to sea, one of the last Spanish shells to strike the torpedo boat hit her near the starboard gun and killed Ens. Worth Bagley who had been helping to direct the warship's maneuvers by carrying instructions from the deck to the base of the engine room ladder. Ens. Bagley had the dubious distinction of being the first naval officer killed in the Spanish-American War; and in memory of his sacrifice and devotion to duty, Torpedo Boat No. 24, Destroyer No. 185, and DD-386 each carried the name, Bagley. ... Badly damaged, Winslow was towed clear of the action. Her commanding officer and a number of others in her crew were wounded. Lt. Bernadou saw that the dead and wounded were transferred to Hudson, and he then left the ship himself after turning command over to Chief Gunner's Mate George P. Brady, who along with Chief Gunner's Mate Hans Johnsen and Chief Machinist T. C. Cooney later received the Medal of Honor and was promoted to warrant officer. ... The day following the engagement, Winslow arrived at Key West for temporary repairs there and at Mobile Ala. She returned to Key West for 10 days before sailing north on 16 August. After brief stops at Port Royal, S.C., and at Norfolk, Va., the ship reached New York on 27 August and was placed out of commission at the New York Navy Yard on 7 September 1898 to begin more extensive repairs.